FORT COLLINS – We often talk about “dream homes” and even “dream kitchens,” but do we think about creating “dream spaces” inside our homes? Crafting custom pullout shelves and drawers, the ingenious designers at ShelfGenie of Fort Collins help homeowners create the spaces of their dreams. ShelfGenie is the leading provider of glide-out shelving solutions. They offer a variety of cabinet space-saving options that make life easier and more efficient for homeowners. ShelfGenie is a special kind of business that provides unique solutions tailored to each individual client’s needs. “We strive to provide accessibility and functionality behind those cabinet doors,” Ketelsen says. 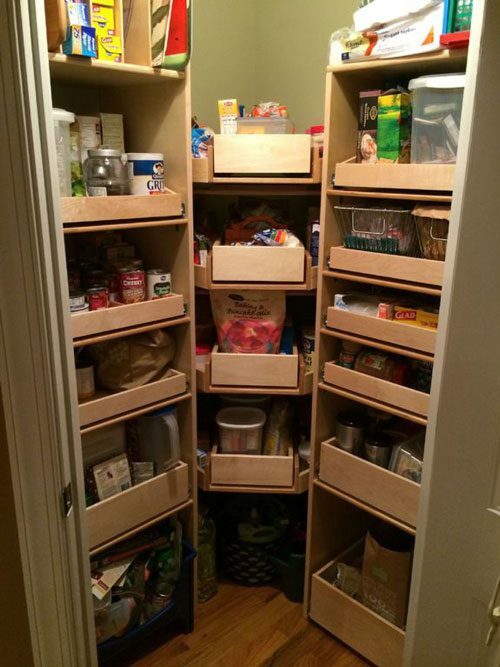 “When a client has difficulty accessing those deep lower cabinets on a daily basis or there is no organization in the cabinets, we can provide a custom solution. They can give a kitchen more counter space and the ability to reach every item. Actually, pretty much every room in the house can benefit from ShelfGenie’s clever solutions. Closets, trash and recycling bins, home office, workshop, game room, entertainment center, and bar may be candidates for creating dream spaces that make life better. Do your computer supplies, craft supplies, and important collections need organizing? Ask ShelfGenie about that. They modify RV’s also! They custom-build their solutions around your specific measurements and obstacles, and will alter any solution to fit your space. Ketelsen explains that most of the quality in the home’s existing cabinets is in their appearance – especially in the cabinet doors – and not in their inside shelving. We want to make the interior cabinet functional and user friendly! Ketelsen explains, “She meant that we created 30% more space for a drawer box we provided than her factory drawer next to it. She also meant that our next job for her will be to replace all of her factory drawers with ours. This will maximize the depth of her cabinet. “That’s what it’s all about – being able to make a difference in the lives of our clients. Nothing is more fulfilling than that! The ShelfGenie of Fort Collins team has a combined 20 years of experience transforming homes. They work hard to create high-quality, custom solutions that improve your home and make your life easier. Owner Merlyn Ketelsen served in the U.S. Army for four years as a paratrooper. He continued his service to the U.S. military as a contractor for 15 years. He supported the Special Forces in several different ways, spending nine years at Range 37, Ft. Bragg and six years overseas. Coming back from his overseas work, he joined the ShelfGenie family and greatly enjoys solving client’s frustrations in their homes. Installer Gordon Freeman was taught construction and carpentry skills at a young age. During his 11-year tenure as a Navy Seabee, he honed his carpentry, HVAC, and project management skills. During this time, Gordon also deployed to Iraq, Kuwait, and Afghanistan, where he worked on civil engineering, humanitarian and facilities management missions. Today, he uses his diverse skill set by working as a contractor for the United States Air Force as well as ShelfGenie. Installer Jim Adams has been in the Fort Collins area for 40 years. He served four years in the U.S. Marine Corps and has more than 30 years experience in the custom cabinet and door industry, including installation and knowledge of all hardware. To see the results that ShelfGenie designers achieve for their clients, visit www.shelfgenie.com/fort-collins. Their online “Solutions Magazine” is filled with photographs and solutions for every room and problem. To contact ShelfGenie for more information and to book an appointment for a designer to visit your home, call 970-682-3317, and check out their facebook page..